At a shelter for battered wives, Marina, who does not want to be identified by her last name, cooks and sells Russian pies to earn money. She and her oldest daughter escaped from her abusive husband three months ago, after she recovered from injuries so severe she was put in a wheelchair. “My husband threw me out from the second floor [balcony] and I got multiple traumas like splintered fractures of the leg. And now I have a plate in my leg, a spinal fracture with three broken vertebrae, head trauma, and broken ribs," she said. “The police came when I was beaten, and later [my husband] even beat me when I was in the wheelchair, hitting my legs,” Marina added. “So they came and said, ‘It is your family matter; you quarrel and then you reconcile." Marina’s husband was jailed for only a few days and has custody of their youngest daughter. Marina is unable to gain custody of her until she is divorced and says she is unable to file for divorce because her husband has her documents. Victims fear police will be even more reluctant to help after Russian lawmakers in January voted to reduce the punishment for some acts of domestic violence to just a fine and days of jail time. A sreengrab from video shows a woman working in the kitchen of the Kitezh Women’s Crisis Center in Moscow. Russian official figures show 40 percent of violent crimes are committed within the family and thousands of women are killed every year as a result of domestic violence. Sponsors of the reduced penalty agree those who cause bodily harm, as in Marina’s case, should still be subject to criminal prosecution. "But when the beatings take place during an emotional conflict caused by a situation, when the people had no intent to inflict a considerable harm to each other, when there is no persecution in relation to a person from another human, in these cases it is acceptable to impose an administrative responsibility [lesser non-criminal charge],” argued Duma Deputy Olga Batalina. The group who initiated the change in the law, Parents’ Resistance, claims a scourge of false accusations broke up families when punishment involved children taken by protective services or parents being sentenced to months or even years in prison. Victims agree that laws on domestic violence need to be clearer. But in practice, victims and their supporters say criminal prosecutions are often difficult as victims are too scared of retribution and authorities do not want to get involved. Some high-profile victims say President Vladimir Putin should reconsider before signing the change into law. Russian lawmaker Olga Batalina, at the podium, addresses members of the Duma (lower parliament house) in Moscow, Russia, Jan. 25, 2017. 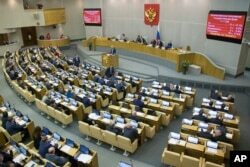 Last month the Duma voted overwhelmingly to eliminate criminal liability for battery on family members that does not cause bodily harm. Valeriya very publicly denounced domestic violence after suffering 10 years of abuse under her former husband, who was also her producer. Regardless of whether Putin signs the change into law, more shelters for domestic abuse victims are needed. Russian official figures show 40 percent of violent crimes are committed within the family and thousands of women are killed every year as a result of domestic violence. Ricardo Marquina Montanana and Olga Pavlova contributed to this report.